Join us for a warm and vibrant evening of poetry! 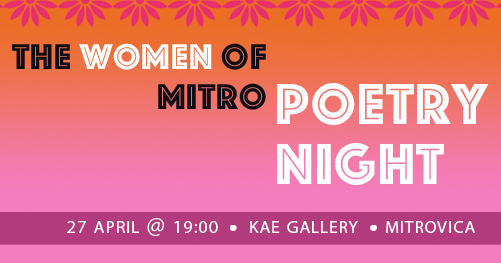 The KAE Gallery celebrates the closing of the “Women of Mitro” exhibition with its first Poetry Night! We invite poets and lovers of poetry to share poems on this special occasion. Female poets — this is your time to shine! Male poets — this is your time to pay tribute! Just sign-up when you arrive and be prepared to read for about three or four minutes each (depending on the number). The occasional song is welcome, too. This event is free and there will be light refreshments served.